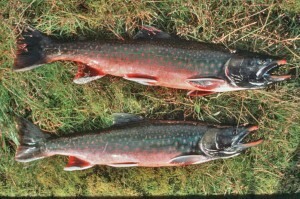 The Arctic char is closely related to both salmon and trout and has many characteristics of both. Arctic char are found in both freshwater and saltwater in Arctic, sub-Arctic and alpine lakes and coastal waters. Their most common name is sometimes spelled charr. Arctic char are found in Alaska, the Canadian Arctic, Northern Europe, and Russia. Landlocked char are found in deep lakes of Scotland and Ireland. In Scandinavia, arctic char are fished extensively. In Siberia, the species is known as goletst. A few char have been caught over 30 pounds. Some of the largest specimens have been landed in Northern Canada, where they are known as iqaluk or ariungmiutaq. The flesh of Arctic char is light, moist, and firm in texture. Char are highly prized for their excellent flavor and high content of Omega 3 fish oil. Whole market sized fish are usually between 2 and 5 lb in weight. The flesh color of char varies from bright red to a pale pink. Both wild caught Arctic char and farm raised fish are available at premium fish markets and seafood retailers.